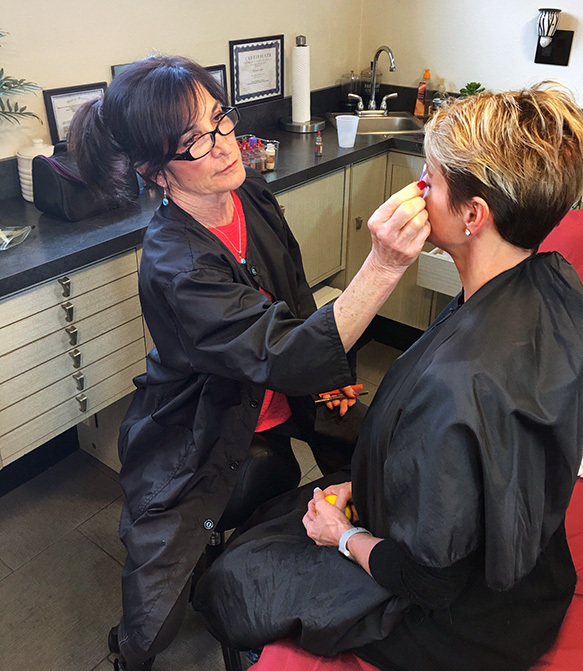 Kneadful Things is a full service day spa and salon offering permanent makeup and cosmetics in Springfield, MO. All permanent cosmetic procedures take about two hours to perform and a few days to heal, although there is really no down time for most clients. Each client is sent home with an after care package which contains ointments and instructions as well as one touch up at no charge from 6 weeks to 3 months post procedure. Only disposable needles and needle covers are used. The procedure areas are numbed topically. All pigments are 99.9% allergy free and organic. Pigments contain NO iron oxide. Colors implant differently on different people. The color should always be there, but will fade with time and elements. It is suggested to retouch after a few years in which case the charges are half of the current price. There are a wide variety of colors and styles to fit every individual. Heads up! Our new scalp micropigmentation services can help with bald areas.